Gather your ingredients and preheat the oven to 350°F and grease the bottom of a 9x13 inch pan. 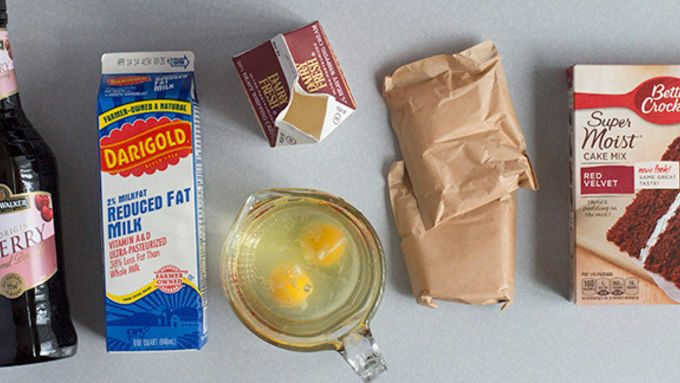 In a large bowl combine eggs, oil, water and cake mix. Beat on low speed for 30 seconds, then medium speed for 2 minutes until it’s thoroughly combined. Pour into prepared pan and bake according to directions on box. 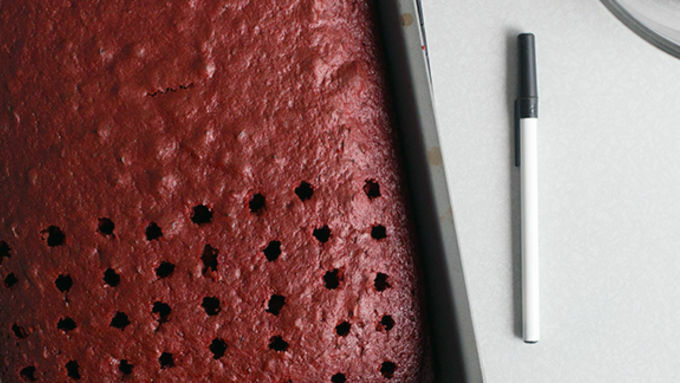 Once baked, let cool for 10 min then use a wooden spoon handle or chopsticks or a ballpoint pen handle to poke a grid of holes all over the cake. Combine milk, instant pudding, and kirsch in a large bowl. 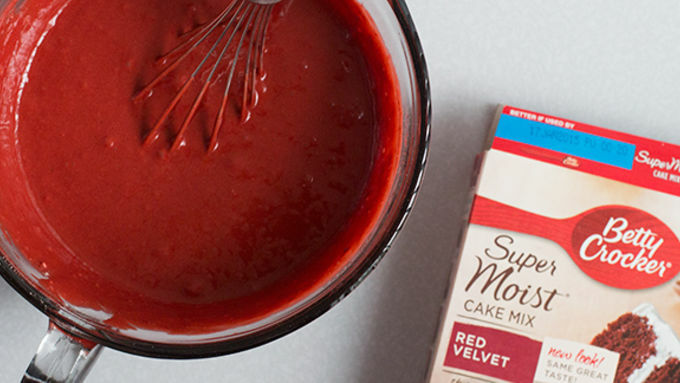 Once mixed together slowly pour onto cake trying to fill all the holes. Once all the pudding is poured out flatten out all the pudding so it’s evenly dispersed then caver in plastic wrap and refrigerate until cooled. To make the topping whip the cream and powdered sugar until stiff peaks form then spread evenly over cake. Serve topped with a maraschino cherry. 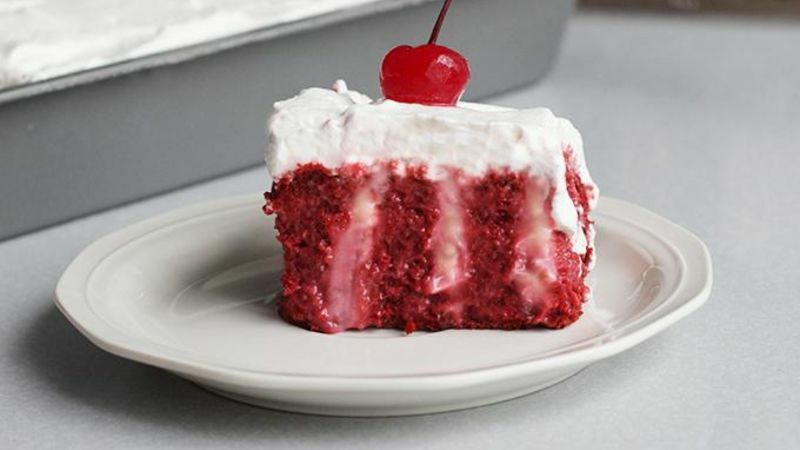 Poke cakes are a classic dessert, but add the twist of cherry brandy and you've got a sweet treat with a kick! 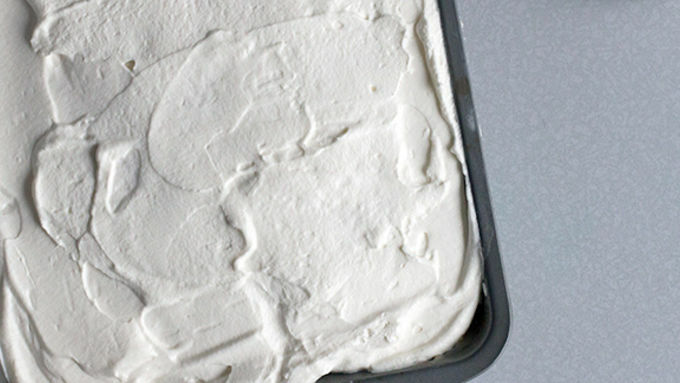 Today we’re taking the classic poke cake to another level. Usually it’s just the cake with some pudding and the artificial whipped topping. 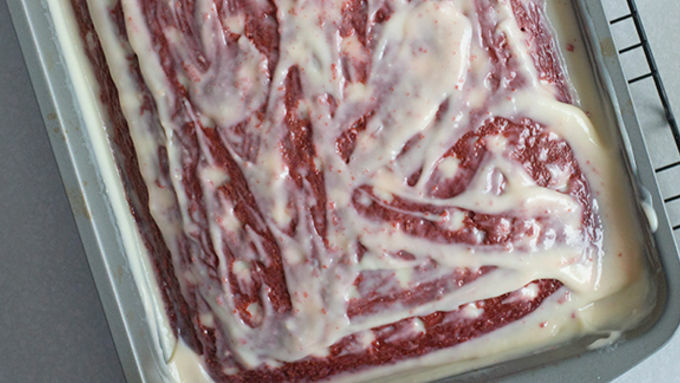 We’re going with red velvet, cheesecake pudding, and fresh whipped cream. Oh, and uh – there’s booze in the pudding. (Maraschino cherry juice would be a perfect substitute). I let the cake sit overnight in the fridge, which isn’t really necessary, but it helps the cake and pudding become a little better friends. You just want to make sure the cake is cooled completely before you put the whip cream on there. Fresh whipped cream is one of my favorites when it comes to cake toppers. You could totally add a splash more of kirsch if you wanted to. 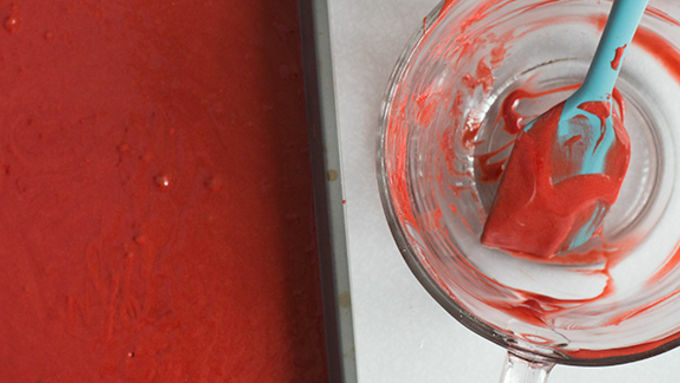 Serve in slices with a maraschino cherry on top!